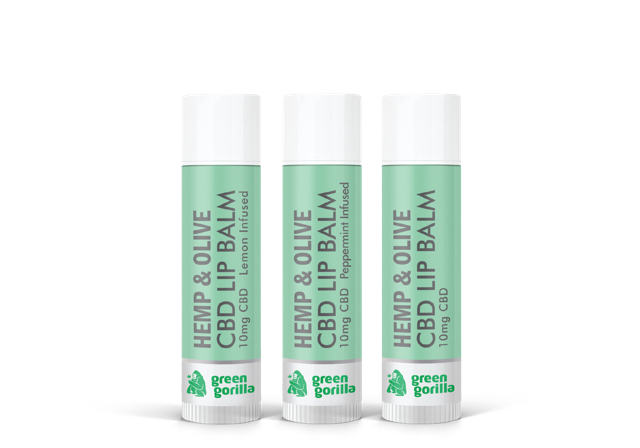 Green Gorilla has launched a new line of ‘Hemp & Olive’ CBD infused Lip Balms which are 0.15oz in size, available in Unflavored, Lemon Infused, and Peppermint Infused options with each containing 10mg of CBD. Each Green Gorilla Lip Balm also has an all-natural SPF element added, so that they have an SPF 25 rating. Los Angeles, CA, July 26, 2016 – ​​Green Gorilla has launched a new line of ‘Hemp & Olive’ CBD infused Lip Balms. Green Gorilla’s “Hemp & Olive” CBD Lip Balms are 0.15oz in size, available in Unflavored, Lemon Infused, and Peppermint Infused options with each containing 10mg of CBD. Each lip balm also has an all-natural SPF element added, so that they have an SPF 25 rating. In time, the company may release additional options for this product, including a larger sized lip balm that could include as much as 100mg of CBD. Green Gorilla (www.ilovegreengorilla.com) products are now available at retail outlets nationally, and on the company’s website. Green Gorilla’s flagship line, Hemp & Olive, features the highest quality CBD Oils, CBD Pet Care products, and now, CBD Cosmetics! Hemp & Olive’s CBD Oils are all 100%: Organic, Non-GMO, Vegan, Plant-Based, Paleo, Kosher, Gluten-Free, Sugar-Free, and THC-Free. The company’s cosmetics are made using the Hemp & Olive CBD Oil as their base. Like the new Lip Balms, all cosmetics products in the Hemp & Olive line are made with 100% Pure Cannabidiol, extracted from Organically Cultivated & Non-GMO Hemp, and purified to its natural crystalline state. Green Gorilla’s CBD is then infused into 100% Organic Extra Virgin Olive Oil, sourced from Award-Winning, boutique California producer, Ojai Olive Oil. That infused olive oil is then used as the base to create a host of cosmetics products, from Lip Balms to Face Creams, Body Lotions, Shampoo & Conditioner, Night-Time Face Masks, Sunscreens, and more. All ingredients used in the Hemp & Olive cosmetics line are 100% natural, and the cosmetics are of unparalleled quality. Most people don’t realize that lip balms are essentially eaten as they are used. When something like a generic Chap Stick is applied, users are consuming any toxic and, or unnatural ingredients that might be used to make that product. The Hemp & Olive Lip Balms being released today are over 90% extra virgin olive oil by content, and made with all healthy and natural ingredients – so that when applied, our consumers are actually doing something good for their bodies as well as protecting their lips. Pure CBD extracted from hemp is the healthiest, safest and highest quality Cannabidiol available. Extra Virgin Olive Oil is the healthiest, safest, and most effective way to deliver CBD to the body. Beyond being the healthiest option, olive oil also has synergistic effects in combination with CBD and is also able to deliver the CBD to the parts of the body that need it most. All Green Gorilla products contain Zero THC, and have no psychoactive properties. While most cosmetics companies will use cheap olive oil, if they even use real olive oil, we use only award winning, organic, extra virgin olive oil. One could even say that the Hemp & Olive cosmetics are essentially “food grade”, as the primary ingredients used are identical to those used in the company’s supplements, and are of the highest possible quality. Green Gorilla Co-Founder and Co-CEO Philip Asquith commented, “I’m very happy to announce the launch of this this new Lip Balm, and the beginning of what will be an amazing lineup of cosmetics and personal care products under the Hemp & Olive brand. CBD and olive oil are an amazing combo to use for products that go on your skin, and I know that people are going to love this stuff. I use our face cream and lip balms every day, and I already can’t imagine not having them.” Green Gorilla’s Steven Saxton added, “At Green Gorilla, we believe that our products are the best in the business. This new Lip Balm is just another example of our commitment to bringing people only the very finest quality.